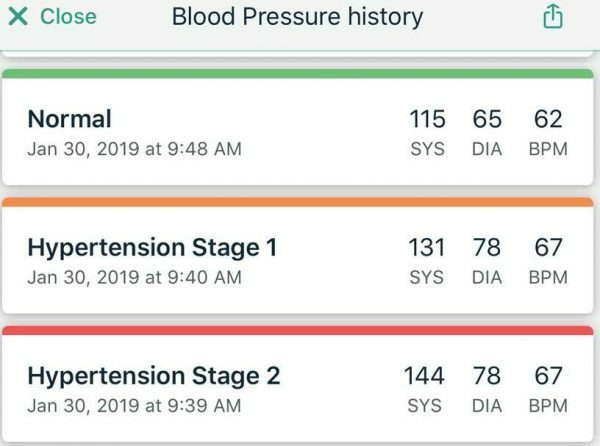 Breathe is a simple and free Apple Watch app that can help you control your blood pressure. When you feel your blood pressure is climbing, spend 1 to 5 minutes with Breathe to bring your blood pressure down. It works miracles for me. Keeping our blood pressure within the guidelines is vital. High blood pressure can cause heart attacks, heart disease, strokes, dementia, damage to the eyes and kidneys. (Mayo Clinic) High blood pressure is insidious and can slowly cause medical problems for decades before the damage is evident. Like many people, I have high blood pressure and take meds to control it. I have heart disease, had a heart attack and small stroke. It’s serious business. I aim to keep my blood pressure below the AHA recommended 120/80. Sometimes the meds don’t work enough. I get in a rush to accomplish something or some interaction with another person gets me stressed. Stress is the big killer. For example, I was trying to get 3 things accomplished before leaving for my CrossFit class two weeks ago. I was rushing around the house and just as I was 40 minutes from start time, I could feel my blood pressure rising. So, I took a minute and checked. Yikes. It was 144/78 and I felt awful. Normally, my only recourse would to lie down for 30 minutes and hope it got better. Instead, I did a series of 1 minute Breathe sessions. 9 minutes later, my blood pressure was down to 115/65 and I was out the door to CrossFit. You can see the effect below. That was the first time I tried Breathe for blood pressure control. My elevated blood pressure is usually caused by stress but who’s isn’t. During times like that in the past, I would lie down and worry, which doesn’t help a bit. “You can use the Breathe app to help you relax and focus on your breathing,” says Apple. When you start Breathe it guides you through a series of deep inhale and exhale breathes, asking you to focus on each breathe. The app provides silent haptic feedback to your wrist to guide the breathes. They are longer and deeper than normal breathing. Deep breathing is a well-known meditation technique that is often taught with Yoga. I remember it from Buddhist reading I did years ago, but most people aren’t going to adopt the cross-legged, lotus sitting position in public but you can use the Breathe app. Using Breathe is so simple you can use it without instructions, like I did for a week. Just press the ” Digital Crown to go to the Home screen, then open the Breathe app.” The onscreen messages tell you to focus on each breathe. Within a few seconds the haptic feedback guides each inhale. I found it useful to say “Inhale Exhale” each time to avoid letting my mind wander. I time the words to last the length of each step. In real a Yoga meditation you would be using a meditation mantra. I never got proficient at that but find “Inhale Exhale” perfect. There is a real art to meditative breathing which you can learn from the Livestrong article or go to a class if you wish. I suggest you read the full Apple article on the app because there are tricks to making the app work. For instance, you can set the time of your Breathe session. My first time I had to restart the app 5 times to get 5 minutes, which did not help the concentration. Breathe was new with the Apple Watch Series 3. I admit I thought it was one of those annoying parts of the Watch like the Stand reminder. My wife and I can be sitting watching Netflix and both our Watches will remind us to stand, simultaneously. How does that work? Since I’m not an Android user, I suggest this article or a search for Android Breathing Meditation. Click HERE to read more from Stephen Pate.